When David Needham and his wife Alyscia moved from San Francisco to Minneapolis in 2013, they didn’t think they’d be able to sustain their car-free life. Eight months later, they drove south to visit family in Texas, left their car behind and flew home. The decision to relinquish their vehicle was aided in part by the fact that Needham and his wife live on University Avenue, just south of the METRO Green Line’s Raymond Avenue Station in the recently-opened C & E Lofts. 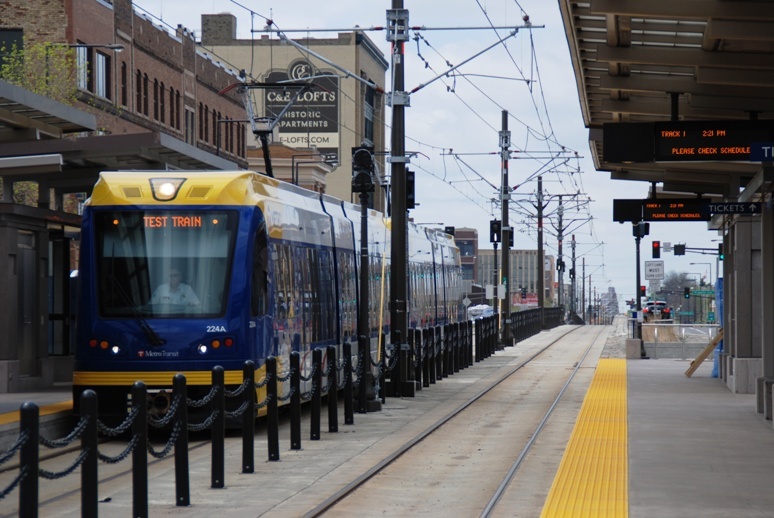 Using the train, they and their 10-month old daughter will be able to ride the train to the airport, get to church in downtown Minneapolis and travel to other destinations along the light-rail line. 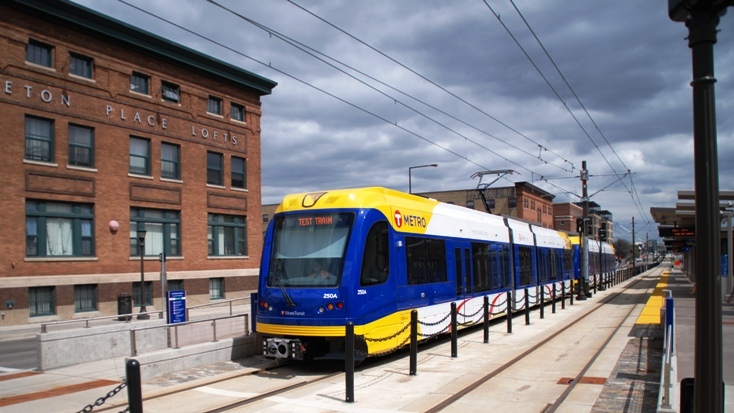 Improved connecting bus services at the station will help them get to Grand Avenue and other key destinations. The ease of traveling to, from and within the St. Anthony Park neighborhood surrounding the Raymond Avenue Station is drawing all types of people like Needham who are looking for a central location with a plethora of transportation options. In their footsteps are a fresh crop of new businesses, residential development and a groundswell of community-building efforts centered on the creative economy. The activity is interwoven with well-established neighborhoods of single-family homes and industry. Among the recent arrivals is Barely Brothers Records, an all-vinyl record shop that opened in February. The record shop sits amid a collection of restaurants and eclectic businesses that line Raymond Avenue and are less than a block north of the Raymond Avenue Station. Mike Elias, who opened Barely Brothers with friend Spencer Brooks, said the store’s proximity to the Raymond Avenue Station was a “major selling point” in choosing where to locate. The hope is to draw from each downtown as well as students from the University of Minnesota. “It should be pretty easy to hop off the train and get right here,” said Elias, who will be able to commute to work using the Green Line and Route 83, a new bus service that will run on Lexington Parkway beginning June 14. Transportation was also a motivating factor for the recent relocation of the Mid-Continent Oceanographic Institute, which was previously located on Lyndale Avenue in Minneapolis. The nonprofit provides tutoring services to nearly 500 youth who come from throughout St. Paul and can now easily reach the center’s office at the corner of University and Raymond avenues. The organization also draws more than 100 tutors, many of whom come from colleges along the Green Line. “We did an informal poll of parents and many of them said they would use the train,” said Chad Kampe, the group’s executive director. Kampe said the cheekishly-named organization is also planning to open a small retail component to raise funds for their work and that being near the station will be a good way to increase visibility and draw in new people. As interest in the area around Raymond Avenue Station grows, developers are breathing new life into old properties and creating new homes for urban dwellers, nonprofits, artists and other small businesses. The C & E Lofts building, where Needham lives, dates to the 1920s and was originally a furniture warehouse and showroom. The 104-unit building reopened in 2013 following a yearlong renovation and now boasts a host of amenities, such as a rooftop deck, bike storage and repair station and an HOURCAR hub. Two blocks south of University Avenue, Minneapolis-based development company First & First is renovating a collection of office and warehouse buildings on Vandalia Street. The Vandalia Tower development will create 200,000 square feet of office, creative and warehouse space that will serve as a hub for creative businesses, technology firms, tradespeople and artists. A restaurant and brewery could also locate there. First & First founder Peter Remes, who grew up nearby, said light rail “was definitely an influencer” in taking on the ambitious redevelopment. Remes said light rail will not only benefit current and future tenants but create a vibrant streetlife that has a positive impact. “New prospective tenants we’ve been in conversation with all view light-rail as a very positive thing,” Remes said. Catherine Reid Day, a Creative Enterprise Zone board member, said the Green Line’s opening is an important milestone that strengthens the group’s efforts and the wider community. Connecting bus routes: Route 16, with local service on University Avenue between Stadium Village Station and downtown St. Paul. Route 30, with service to Northeast and North Minneapolis. Route 63, with service on Grand Avenue to downtown St. Paul. Route 67, with service on Minnehaha and Thomas avenues to downtown St. Paul and west on Franklin Avenue to the METRO Blue Line’s Franklin Avenue Station. Route 87, with service on Raymond and Cleveland avenues between the Rosedale Transit Center and Highland Park. 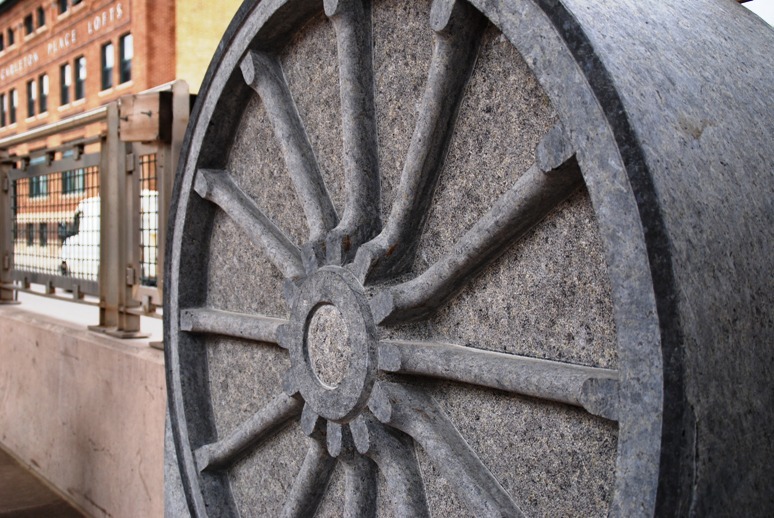 Public art: Andrea Myklebust and Stanton Sears carved wheels out of granite that mimic those on earlier modes of transportation, including streetcars and Empire Builder passenger trains. Myklebust and Sears created similar works for the Green Line’s Westgate and Union Depot stations. Learn more. Area landmarks: Hampden Park, Jennings Community Learning Center, Avalon School, St. Anthony Park Branch Library, Langford Recreation Center, College Park, Commonwealth Park, Luther Seminary, Murray Middle School, University of Minnesota-St. Paul Campus, Desnoyer Park. Bike-ped connections: The City of St. Paul recently rebuilt Raymond Avenue, adding bike lanes between University and Hampden Avenues, as well as wider sidewalks and pedestrian-friendly medians. Further north, there is a seven-mile stretch of Como Avenue with bike lanes between the U of M campus and Rice Street. A Nice Ride kiosk is located at University Avenue and Carleton Street.